Innovative one-piece TPU injected dual compound foot shell with excellent impact and abrasion resistance and unmatched levels of safety. This shell is reinforced by a metal shank inside and toe reinforcement co-injected in harder compound. 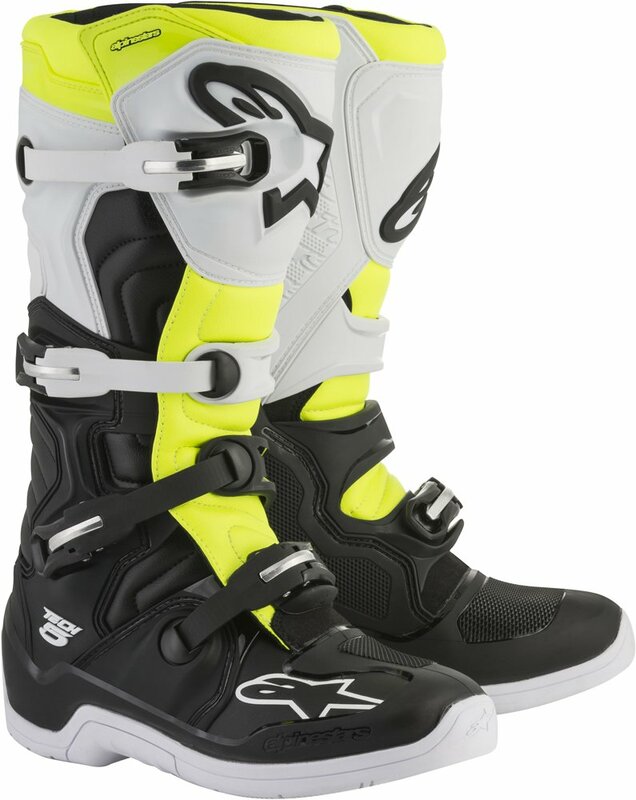 Coming within the wake of the hugely successful and iconic Tech 10 and Tech 7 the brand new Tech 5 is an advanced multi-Subject matter, multi-panel construction boot that further strengthens Alpinestars line-up of class-leading motocross and off-road boots. Incorporating an innovative microfiber chassis, which is extremely durable and lightweight, a medial biomechanical pivot system for superb levels of improve and stability and extended accordion flex zones, the Tech 5 affords performance fit and high levels of comfort and durability. Innovative one-piece TPU injected dual compound foot shell with superb have an effect on and abrasion resistance and unmatched levels of safety. This shell is reinforced by a metal shank inside and toe reinforcement co-injected in harder compound. Soft poly-foam surrounded the ankles and collar offer shock absorbing performance, plus full interior textile lining for comfort. Innovative buckle closure system accommodates polymer and fiberglass buckle arms and high-have an effect on aluminum bridge closures for durability and weight-saving. Buckle system features memory and a quick release/locking system with self-aligning design for simple, precise closure and improved riding performance and security. All buckles are easily replaceable. The TPU buckle straps are ergonomically profiled to advertise high levels of front flexion.